I actually like cold showers in the heat of summer after being outside doing some yard work. In the winter though I tend to take showers that are too hot. I come out of it looking like I have a sunburn and an hour later my whole body itches like crazy. I haven’t melted the shower curtain so I haven’t caused any permanent damage yet. This one got me…the funny! Can’t quite figure out this week’s theme. Does it have one? I’ve had that shower. Brrrrr! 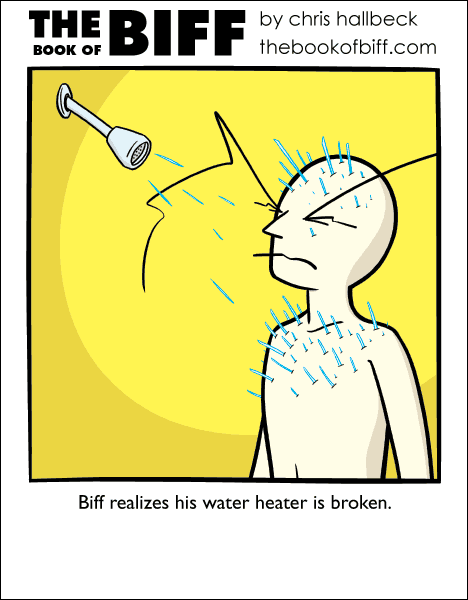 That’s life with a shower that only has two different temperatures for the water; icicles or severe burn injuries. Biff now has super quill-shooting powers. Whenever he’s in the middle of a fight with a villain and gets out of quills, he has to run to the nearest shower and turn it on its coldest setting. Better hope villains hibernate for the summer. Getting clean and quick acupuncture? Bonus!